Pop punk band from Santa Barbara, California, with a certain fascination for the Star Wars film The Empire Strikes Back. Is a nerf-herder something very terrible? Not really, no. It is a kind of simple peasant who guards nerfs. 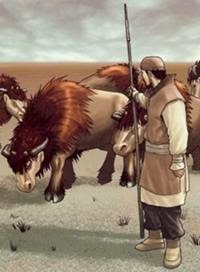 A nerf - as Wookieepedia ('The Star Wars Wiki') tells us - is a four-footed mammal that has much in common with Scottish Highland cattle. Nerfs are actually not found in Scotland, but they are in all other parts of our galaxy.